Owing to the rapid technological advancements and the stronger need to understand the behavior of customer, the machine learning as a service market is expected to witness an exponential boom in the years to come. Machine learning as a service is a span of services that provides tools for machine learning as a part of cloud computing services. The providers of machine learning for service offers various tools such as API, natural language processing, data visualization, deep learning and predictive analytics. Generally, Machine Learning is an Artificial Intelligence programmed application. Major factors boosting the growth of the machine learning as a service market are the adoption of cloud based technologies and technological advancements into the computing world. Moreover, the increase in demand for understanding customer behavior in terms of machine learning is also propelling the market. The global machine learning as a service market is estimated to be valued at USD 3755.0 mn by the end of 2021. The forecast period is set from 2017 to 2021 and the CAGR is seen to be 43.7%. As per the 2016 records the market value was worth USD 613.4 mn, thus showing a remarkable rate of growth in the years to come. The global machine learning as a service market is categorized on the basis of component, application, organization size, and vertical. Based on segmentation by component, the global market is divided into services and software where further segmentation of software tools is Cloud and Web-Based Application Programming Interface, Data Storage and Archiving, and Modeler and Processing, and further segmentation of services includes managed services, and professional services. Based on classification by application, the market is grouped into Network Analytics and Automated Traffic Management, Marketing and Advertising, Predictive Maintenance, Augmented Reality, and Fraud Detection and Risk Analytics. With respect to organization size, the market is categorized into Large Enterprises, medium and small enterprises. On the basis of vertical, the market is categorized into telecom, media and entertainment, defense, education, healthcare and life sciences, e-commerce and retail. Transportation and automotive, financial services and banking, and insurance. Among these, the healthcare and Lifesciences sector is witnessed to be dominating the market. This is owing to the increasing need for machine learning in the healthcare and medical sector in order to keep records of patients in a structural way. 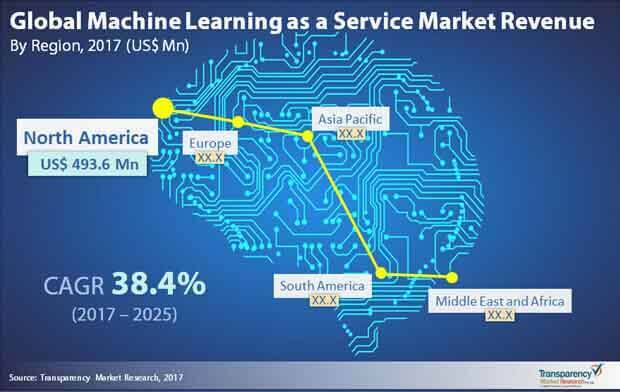 The global machine learning as a service market is studied on the basis of key geographies North America, Asia Pacific, Middle East and Africa, Europe, and South America. The market is projected to be dominated by the North American region because of the booming demand for machine learning as a service with large amount of data and other innovative technologies along with the rising demand for Internet of Things (IoT). Besides, North America is home to most of the prominent player’s base camps in the countries of Canada and the U.S., which further accelerates the market in the long run. Important players of the machine learning as a service market are Google Inc., Microsoft Corporation, IBM Corporation, Amazon Web Services, and FICO. The report also includes competition landscape which include competition matrix, market share analysis of major players in the global machine learning as a service market based on their 2016 revenues and profiles of major players. Competition matrix benchmarks leading players on the basis of their capabilities and potential to grow. Factors including market position, offerings and R&D focus are attributed to company’s capabilities. Factors including top line growth, market share, segment growth, infrastructure facilities and future outlook are attributed to company’s potential to grow. This section also identifies and includes various recent developments carried out by the leading players.